There are a variety of adjectives that can describe my personal style, but I would say that my outfits usually represent descriptive words such as "colorful," "glam," and sometimes even "over the top." But every now and then, I like to keep things casually chic. This simple shorts outfit that I wore while studying for exams last week is a perfect example of what it looks like when I dress down. This is a functional outfit that is still put-together and coordinating, but not too overdone. Everything that I'm wearing in this outfit has been featured on my blog before! I know that many of y'all enjoy my restyled fashion posts, so I try and incorporate them into my content from time to time. It definitely isn't realistic for someone on my budget to be wearing new clothes 100% of the time, so I enjoy finding creative ways to re-wear pieces that I already own. Also! The tassel earrings that I'm wearing here are a favorite pair of mine, and I got an incredible bargain on them at one of my favorite stores back home in Maine. (Incredible bargain as in I paid under $5!) But the good news for all of you is that I found a similar pair of tassel earrings online at an equally similar price point, these are also priced under $5! Be sure that you're following me on Snapchat- tomorrow evening I'm scheduled to be starting something exciting for the blog and I can't wait to share more! My Snapchat username is the same as my Instagram: @miss_alk. such a cute weekend look. love the simplicity of your outfit paired with such trendy accessories! Your styled down look is super cute. I love dressed up and super girly outfits as well but there are definitely days that I opt for something cute and casual. In fact, yesterday I wore a really similar look with pink shorts and a striped top. Super cute girl! This look is pretty much my everyday go-to! 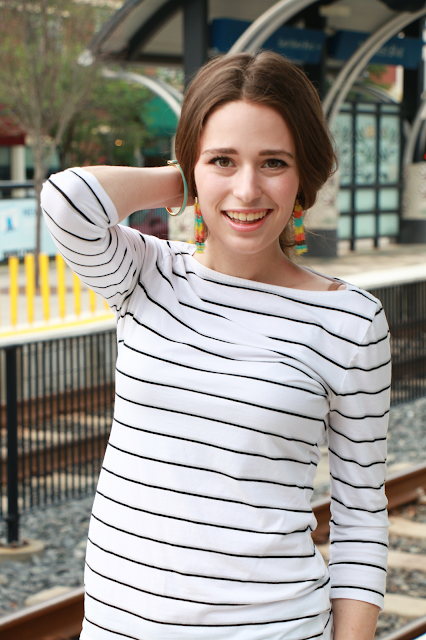 A striped top and colored shorts, what could be better?! Looking forward to seeing what you've got up on snapchat! This is the cutest casual look! Those earrings are ADORABLE!!! LOVE this outfit! I pretty much dress like this every day, haha. And I am always a fan of everything stripes - so I may need to go snag that top! Love that striped top and those earrings! such a cute and simple look! Perfect for the hotter days! Simple can be SO cute! I absolutely love your sandals. Stripes and statement shoes... I'm sold!! I love this look, so spring!! Loving those colorful earrings to spice up the outfit! Too fun!